Don’t be put off cooking fish because you think it is too complicated. 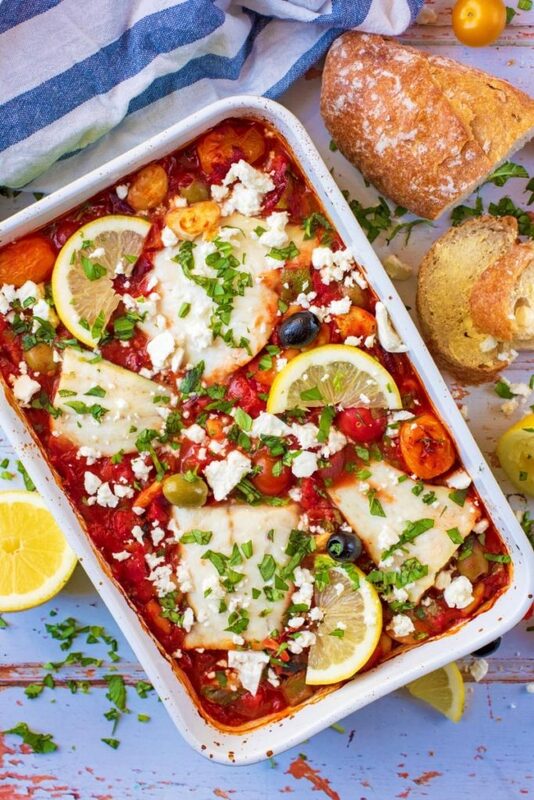 This Mediterranean Cod Bake couldn’t be any simpler (unless someone cooked it for you) and it’s bursting with summery Mediterranean flavours. Salty olives and feta, crunchy peppers, tomatoes and flaky cod fillets. If you are looking for a quick and easy meal that is healthy, protein packed and definitely not lacking in flavour, then this is it. Don’t be put off cooking with fish, as this simple cod recipe couldn’t be any easier. Serve with some homemade potato fries for a healthy twist on fish and chips. 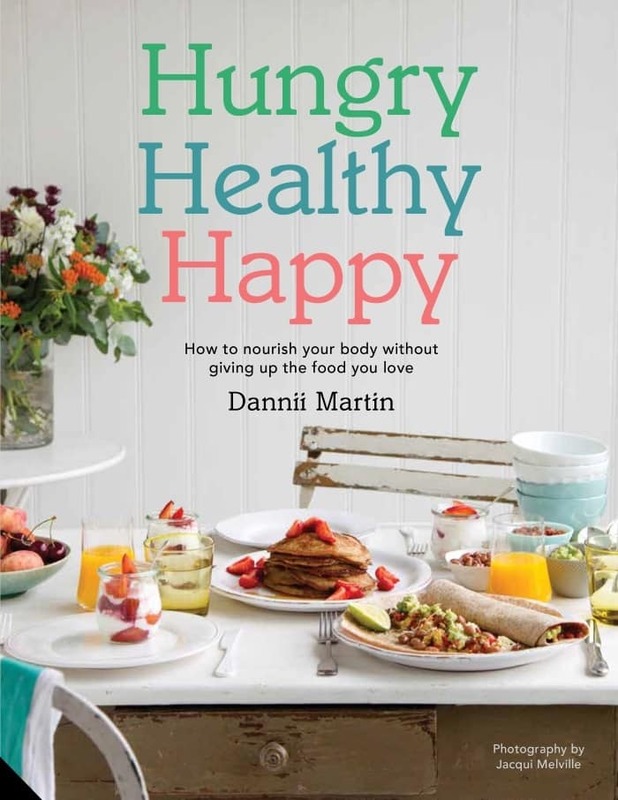 If you have a copy of my book, Hungry Healthy Happy, then you will have seen a variation of this recipe in there and you might have even tried it. If you haven’t bought my book now, head over to Amazon and pick up a copy! It’s available to order in all good book stores too. This recipe is too good not to share here on the blog too, and I thought I would give those of you that don’t have the book yet a little taster of what you can expect from it. This time we made a few variations and one of them is feta. Feta makes everything better! 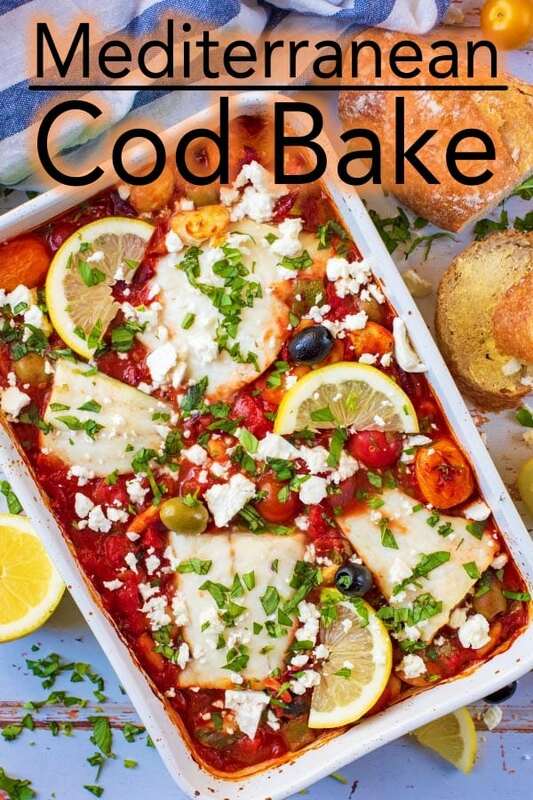 We have used cod in this fish bake, but you can swap it for something like haddock, tuna or salmon, or even use some king prawns instead. If fish isn’t your thing, you could even use chicken or tofu. Like all our dishes, this is easy to adapt. You could also add some chunks of cooked potatoes or some grains like rice or quinoa to make it a really filling meal. We just served ours with some chunks of crusty French bread. This dish has all the ingredients that you would expect from a Mediterranean dish – fresh bell peppers, herbs, olives and of course tomatoes. I mean, is there anything that you can’t do with a can of chopped tomatoes? I know I say it time and time again, but if you always have a can of chopped tomatoes in your cupboard, then you always have the base of a delicious and healthy meal. You just throw in whatever else you have around and that’s exactly how this simple cod recipe was created. This dish is one of those where you throw everything in and it’s mostly store cupboard essentials. If you are using up leftover vegetables, then it is really only the fish that you need to buy fresh. And the feta – don’t forget the feta. One: Preheat the oven to 200°C/400°F. Two: Heat the oil in a large sauce pan over a medium heat. Add the onion, garlic, bell peppers and cook for 2 minutes, stirring continuously. Three: Add the tomatoes, tomato puree, lemon juice and cherry tomatoes to the pan and stir well and cook for a further 3 minutes. Season to taste and add the parsley and basil and stir. Four: Finally, add the sauce to the bottom of a baking dish and top with the cod and scatter the olives on top. Put the dish in the oven for 20 minutes, or until the fish is cooked though. Five: Scatter extra herbs on top and crumble the feta. Serve with crusty bread and butter. Swap with cod for haddock, tuna, salmon or king prawns if you want to use a different fish. Or you could use grilled chicken or tofu instead. Bulk the fish bake out by adding potatoes, rice, quinoa for a more filling meal. If you didn’t want to use feta, then you could add cheddar on top which would be more melty. You could even then pop it under the grill to get it nice and crispy. 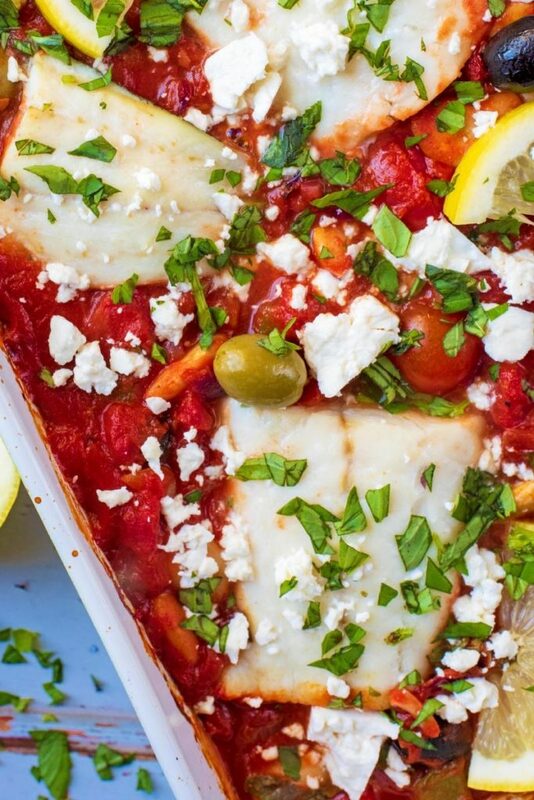 Do you want to be kept up to date on more delicious posts like this Mediterranean Cod Bake? Please subscribe to the blog mailing list (it takes 30 seconds). 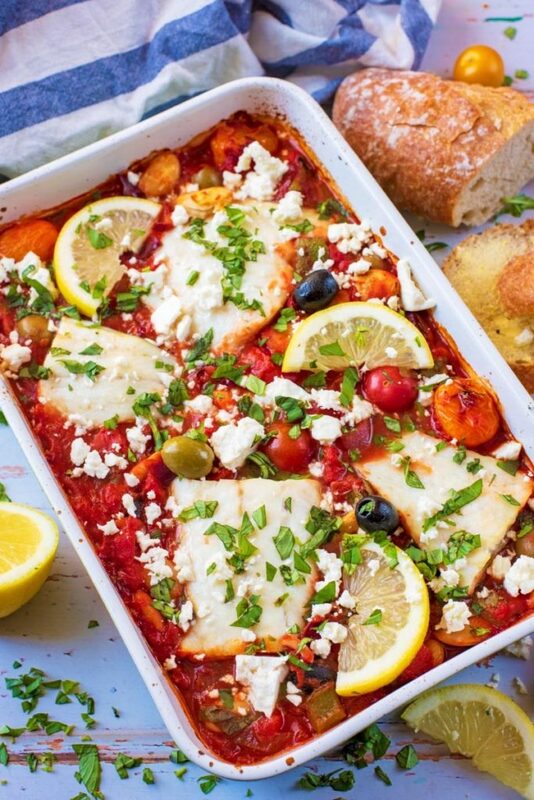 If you’ve tried this Mediterranean Cod Bake, or any other recipe on the blog, then let us know how you got on in the comments below, we love hearing from you! You can also FOLLOW US on FACEBOOK, TWITTER, INSTAGRAM and PINTEREST to see more delicious recipe ideas, behind the scenes shots and also what we are getting up to. 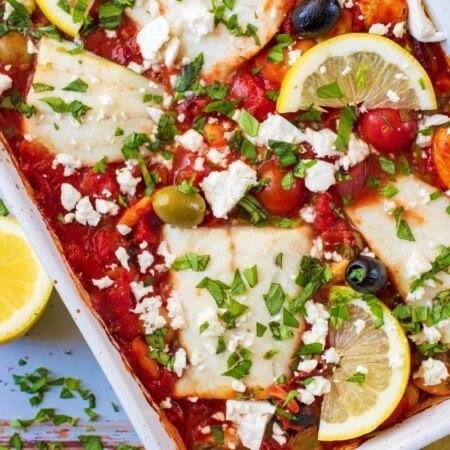 This Mediterranean Cod Bake couldn't be any simpler and it's bursting with summery Mediterranean flavours. Salty olives and feta, crunchy peppers, tomatoes and flaky cod fillets. Heat the oil in a large sauce pan over a medium heat. Add the onion, garlic, bell peppers and cook for 2 minutes, stirring continuously. Add the tomatoes, tomato puree, lemon juice and cherry tomatoes to the pan and stir well and cook for a further 3 minutes. Season to taste and add the parsley and basil and stir. Finally, add the sauce to the bottom of a baking dish and top with the cod and scatter the olives on top. Put the dish in the oven for 20 minutes, or until the fish is cooked though. Scatter extra herbs on top and crumble the feta. Serve with crusty bread and butter. If you didn't want to use feta, then you could add cheddar on top which would be more melty. You could even then pop it under the grill to get it nice and crispy. This post was first published 16th August 2016 and updated 25th January 2019. Oh my word, this looks and sound divine. Must try it the weekend for hubbie and I.
I’m not a huge fan of fish, unless its prawns. Great recipe as always, I could look at incorporating this into a similar dish! I do quite like fish and this looks like a great low calorie recipe for the summer. I need to eat more fish! This looks so tasty… and healthy. Gotta try this out. Oh my goodness these sounds right up my street – going to get everything to make this next week!! I’ve had such a thing for olives lately. I have them in my scrambled egg (with cheese) in the morning and it’s soo good. Love the favours in the this. I find cod can be a bit boring but this sounds really nice. This sounds like a perfect dinner for the summer, healthy too!